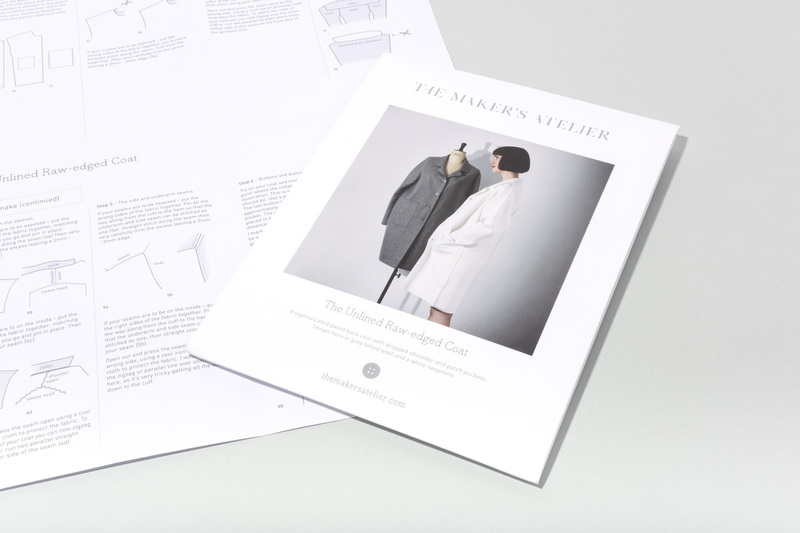 In this post, we have traced the pattern and prepared a first toile for The Maker’s Atelier pattern, The Unlined Raw-edged Coat. 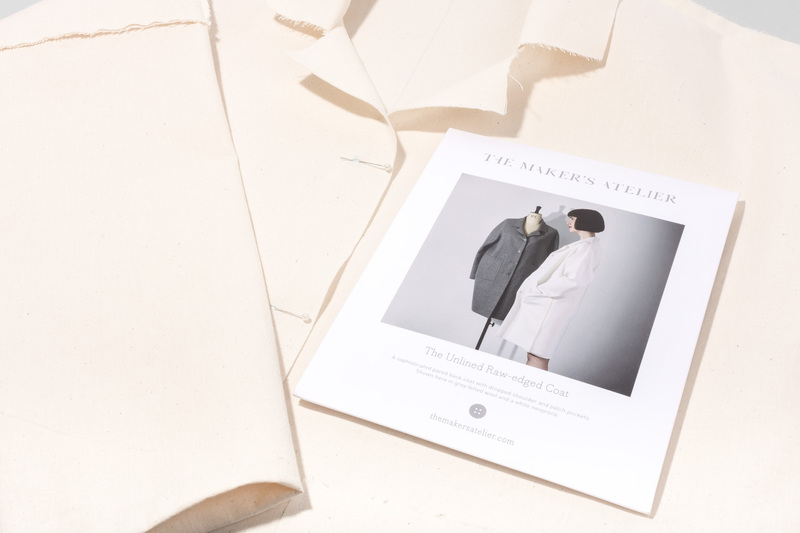 This allows us to familiarise ourselves with the pattern, and fit a simple calico version of the toile before moving into the final fabric. 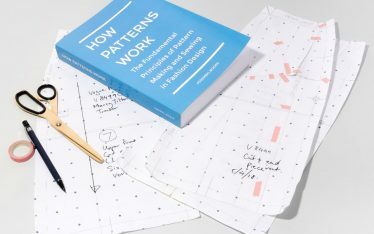 This pattern is available as a printed pattern and comes in a beautifully printed envelope with full instructions. From the line drawing and photo on the front, you can see that the silhouette is intended to be a comfortably loose shape with dropped shoulders. 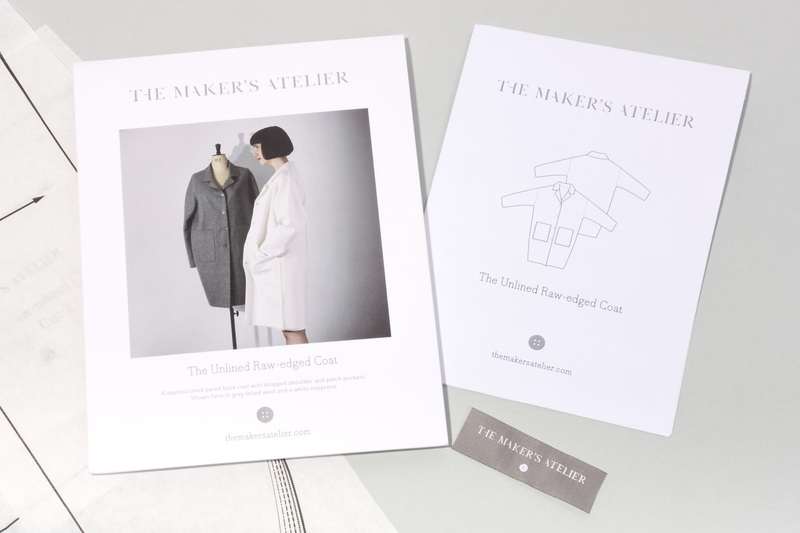 As an extra detail, this pattern also comes with a label that you can sew into your finished garment. 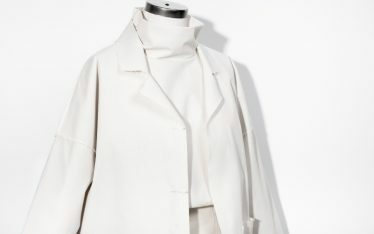 The name also gives clues about the designer’s intended feeling for the coat. 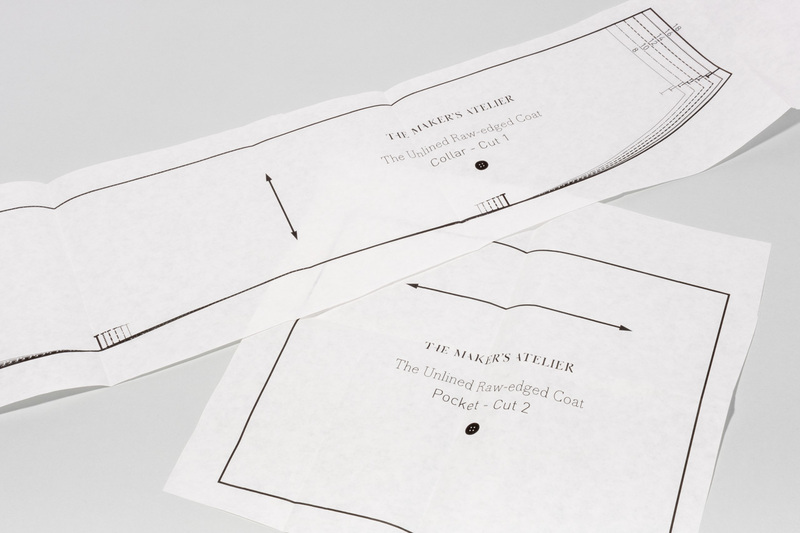 ‘Unlined’ hints at the more casual construction of the garment, while ‘raw-edged’ suggests a raw edge finish for the exposed edges. In this case, the toile is being made up in a Size 8. In preparation for the toile, the pattern has been traced onto spot and cross paper. Where there are pieces that need to be cut ‘on the fold’ these have been cut as full size pattern pieces to ensure they are cut out more accurately. 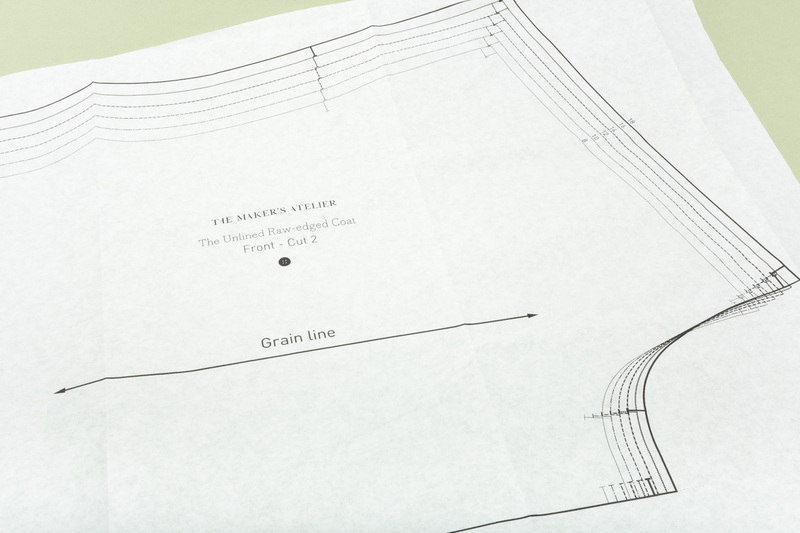 When tracing the collar, this was traced onto folded spot and cross paper to ensure that the traced pattern would be perfectly symmetrical. 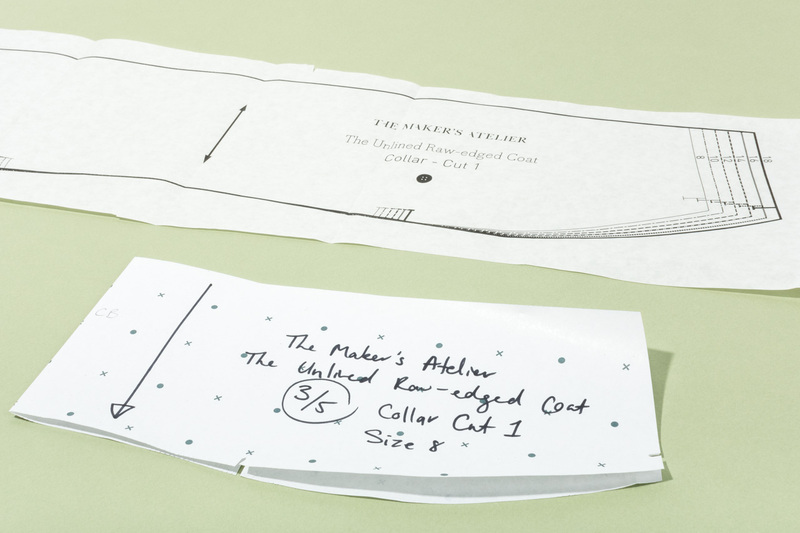 For this toile, we have cut the pattern in calico (sometimes called muslin in the US). In the images below you can see how the pattern makes up in a Size 8. We have desaturated the colour of the calico in these photos so that you can focus on the silhouette and details. 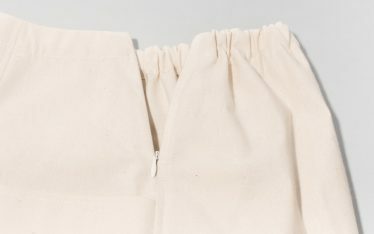 This has been made up as suggested in the instructions, however, the sleeve has been folded up to a shorter length, as discussed below. 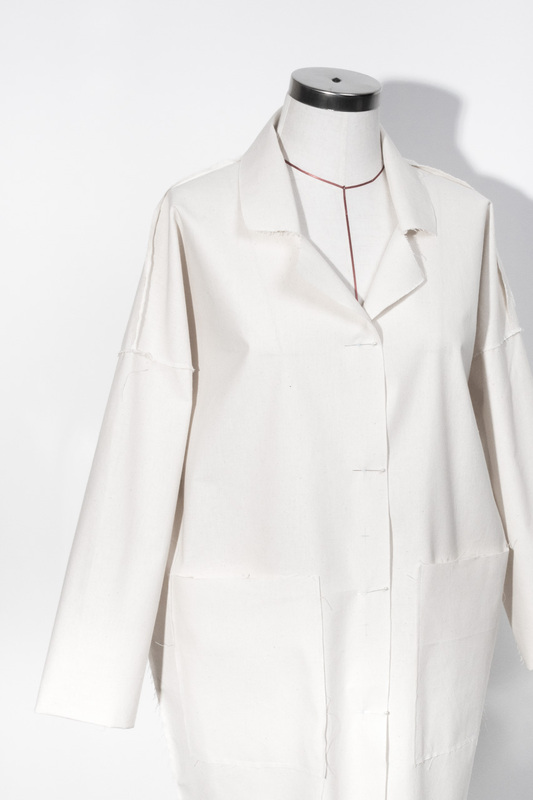 There were no significant changes in this case that would require a second toile, but there are some small tweaks to the pattern that will be made before cutting a final garment. 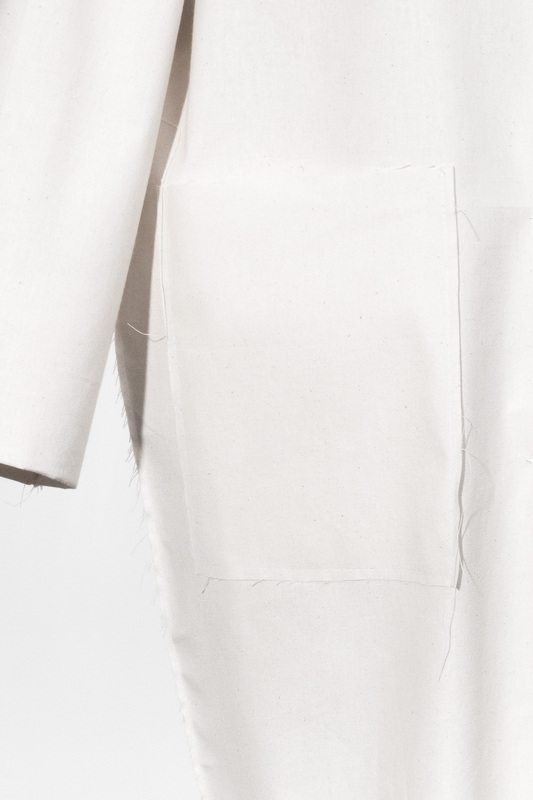 Shorten sleeve by 9 cm as measured along the inside seam. 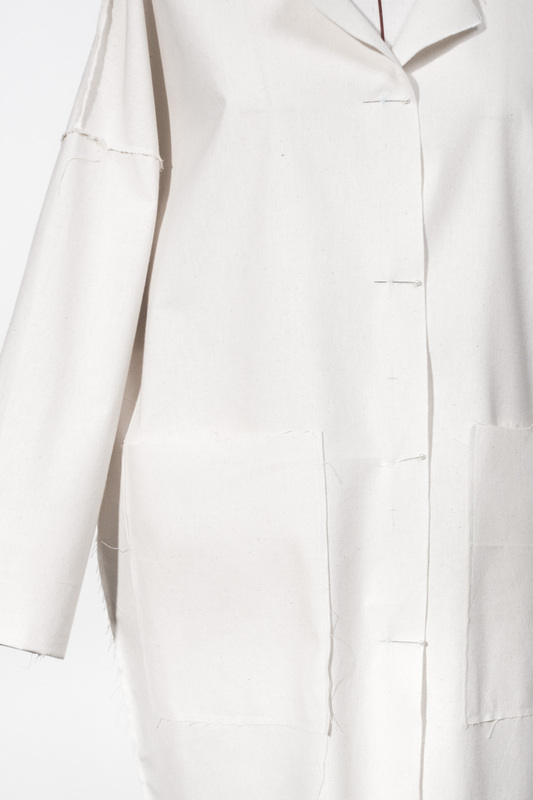 This is a personal choice, but the cocoon shape of this coat really lends itself to a nice ‘bracelet length’, slightly cropped sleeve. 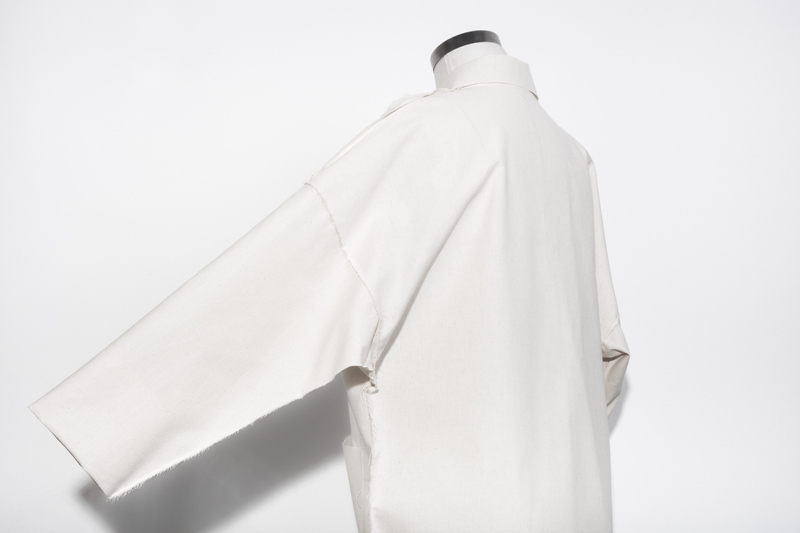 Also slightly change taper of sleeve seam to narrow sleeve at edge and square new hem edge. Mark button positions onto pattern from toile, button placement here is shown spaced 13 cm apart. CF will be 2.5 cm from front edge i.e. centre of buttons will be sewn onto garment 2.5cm from front raw edge. You may need to alter this position depending on your fabric choice or the size of your buttons. Pockets are quite high. 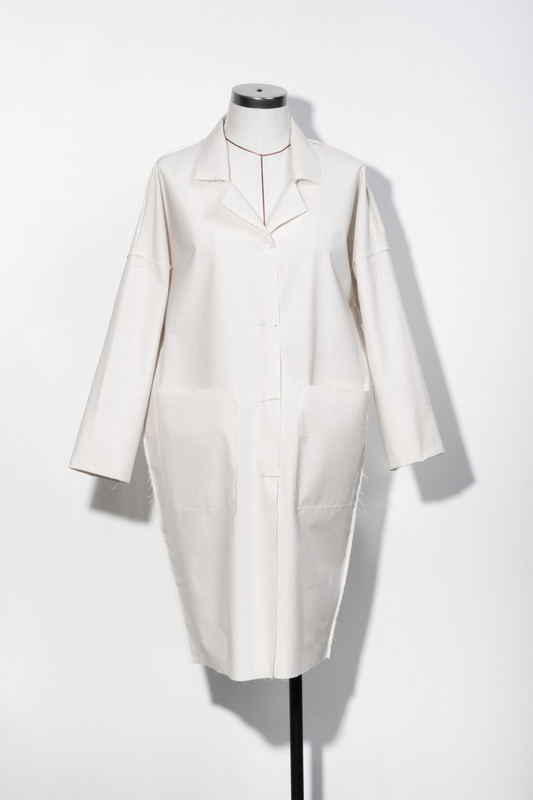 At a good usable height, but look quite high visually in proportion to the rest of the coat. 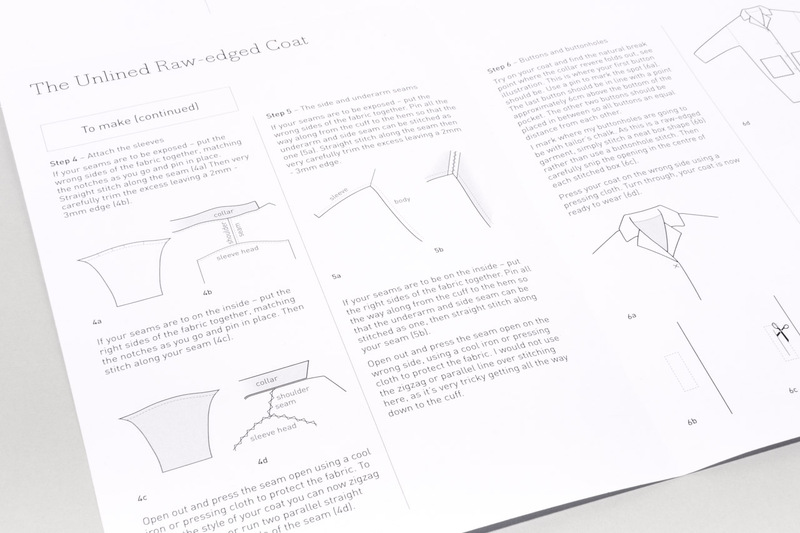 There is the option to change the pocket shape, size and position for future versions depending on fabric and finish. 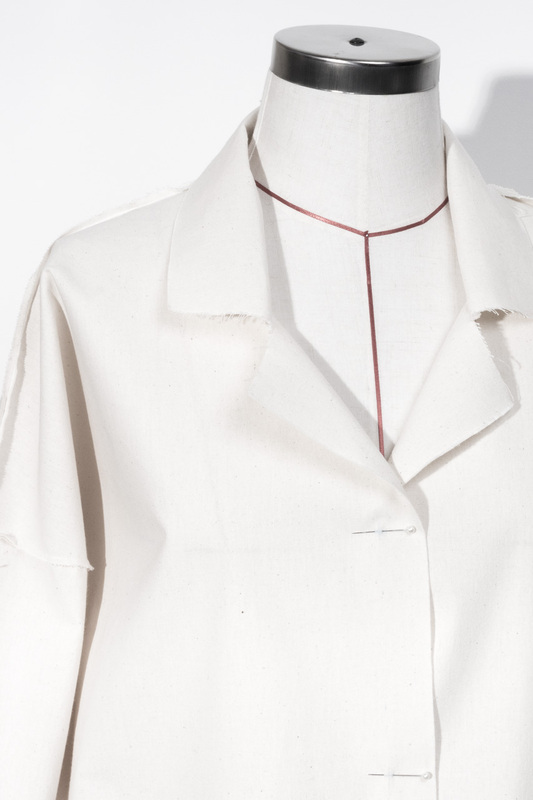 Something to be aware of – there is quite a lot of ease (about 1.5 cm each side) when putting in collar between shoulder seam and CF, so you may need to consider this for different fabrics. Neck seam at this point is 14 cm long. Collar seam length here is about 15.5 cm. 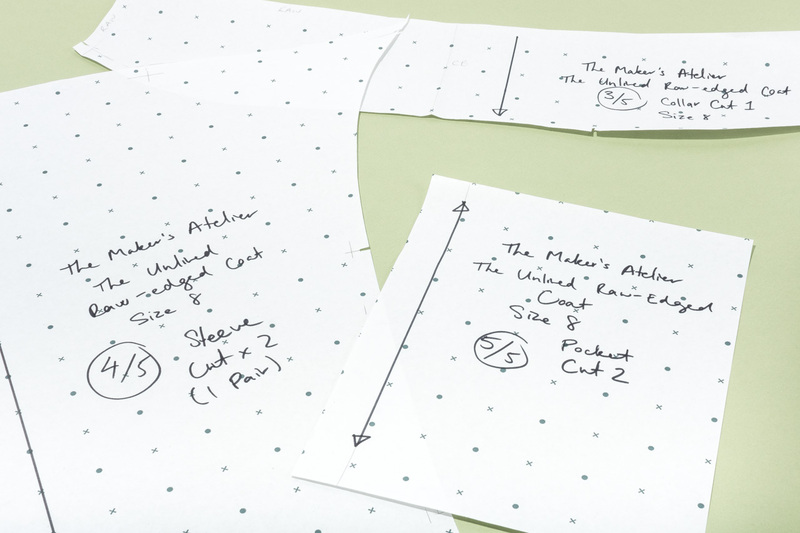 Seam and hem allowance is not included on pattern on most edges as it is intended to be cut with raw edges. If you decide to switch to a different seam finish, then you would need to change the seam allowances on your pattern. 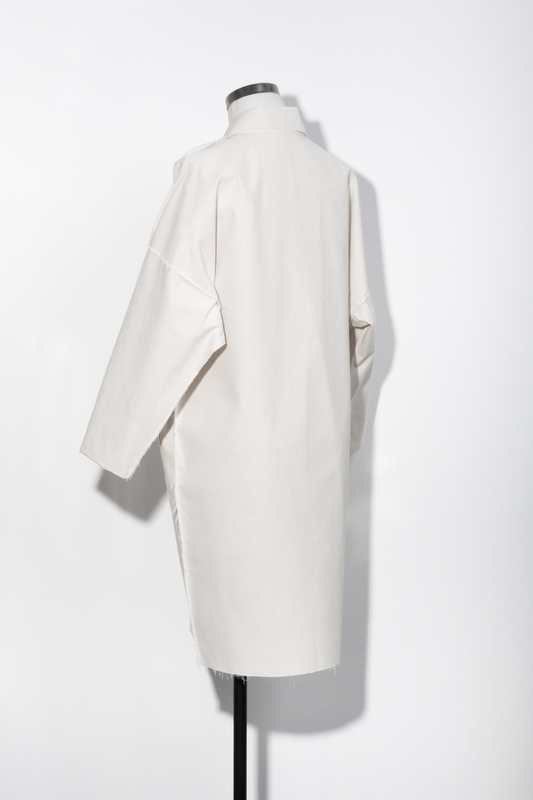 The front of the coat folds back on itself and as it is unlined, there is no facing. This may affect your fabric choice, or give you the chance to show the reverse side of the fabric in an interesting way.